The Scottish Football Blog: Tony, Tony what's the score? Tony, Tony what's the score? 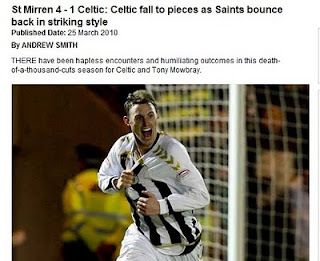 Even in this desperate season for Tony Mowbray's Celtic, this was a big result. A result that might yet see the manager emptied, a result that ended any misplaced hooped hopes of dragging Rangers into a battle for the Championship. So you would expect The Scotsman, Scotland's national newspaper, to get the score right. You would, wouldn't you? Are Hibs ready for a ding-dong in Dingwall?